One of my sons, Dr. Thomas M. Mingus, lives near Slippery Rock, Pennsylvania. I stopped by his place this weekend on my way to Pittsburgh for a speaking engagement at the Greater Pittsburgh Civil War Round Table. On a gorgeous Sunday afternoon, we went exploring some of the historical sites in the area. Less than two miles west of Slippery Rock along Wolf Creek is the site of an old Delaware Indian village dating from the 18th century and earlier. Archaeological studies have revealed the location of some of the structures associated with the settlement. 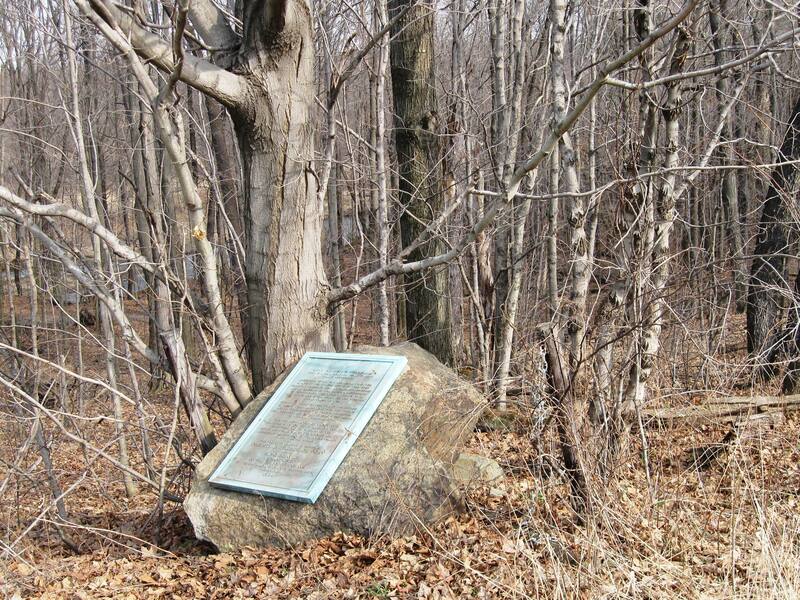 During the French & Indian War, this village was an active site for some of the French-allied warriors. 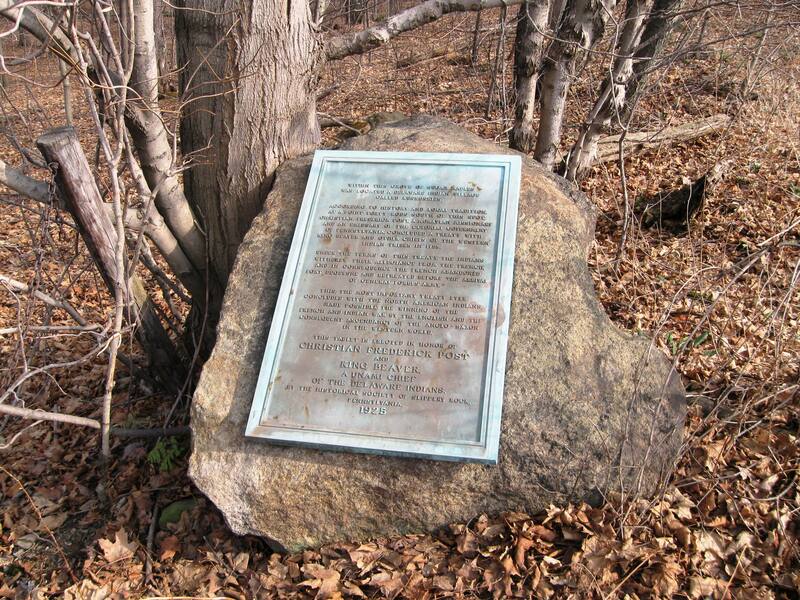 A peace treaty signed near this marker was among the important steps that finally led to a cessation of hostilities between the colonial settlers and the natives. 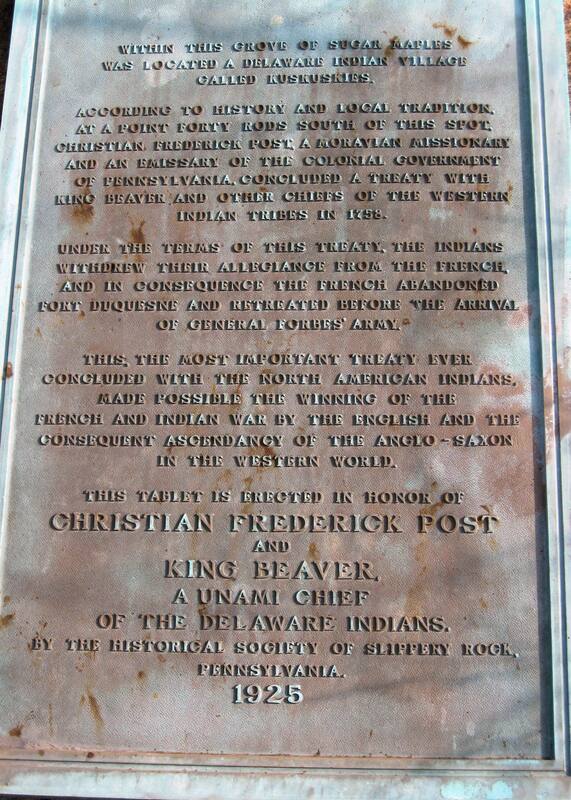 A Moravian missionary named Christian Frederick Post convinced King Beaver (aka Tamaqua) of the Delawares to lay down the hatchet. I find it interesting that this out-of-way and very obscure historical site marks the location of the signing of the “most important treaty ever concluded with the North American Indians…,” a strong claim considering how many other treaties were signed in the ensuing decades across the continent as white civilization expanded westward in accordnace with the “manifest destiny” movement. Wolf Creek is barely discernible in the left center of this photo; it is much more visible in person. The ground slopes off in a series of low shelves down to the creek bed. King Beaver and his “turkey clan” of Delawares lived in this general vicinity in log huts. For more information, click here. The site is now a public park, with a very relaxing hiking trail through a wooded creekside environment. Parking is somewhat limited and there are no bathroom facilities, but this is a neat area tucked in the middle of a farming area that is slowly being developed. The historical society and local government is to be commended for preserving the site of the Delaware village as a public park. 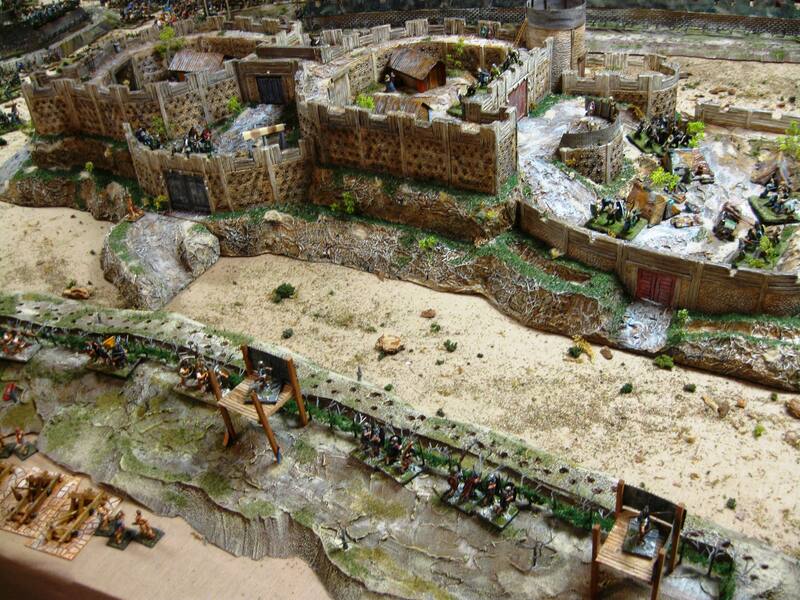 How’s this for a very large gaming layout / Civil War diorama? The tabletop is 80 square meters (yes, 80!!!) 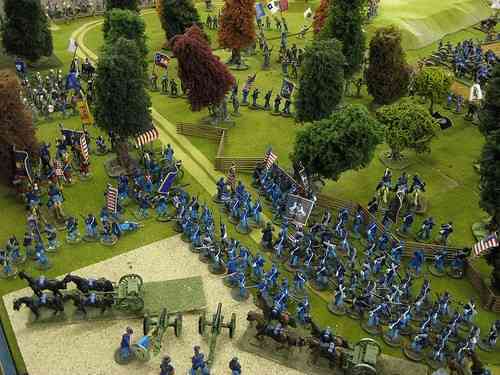 in area and there are 25,000 carefully painted 25mm figures in miniature action! 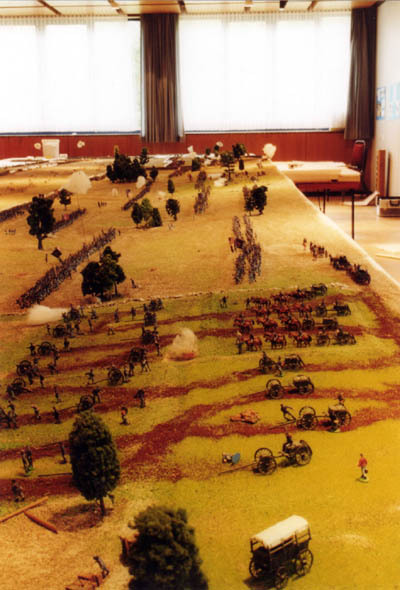 A gaming group in Germany has constructed this impressive layout for their planned refight of the Battle of Gettysburg in miniature. For more photos by Uwe Wild, please click here. 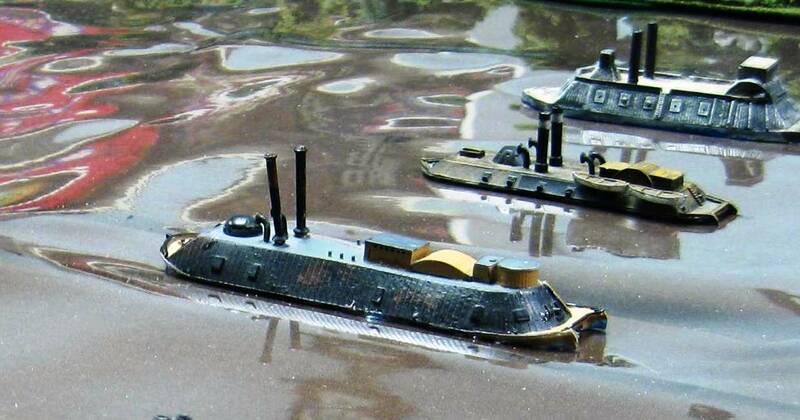 On-line ACW naval ship registry! 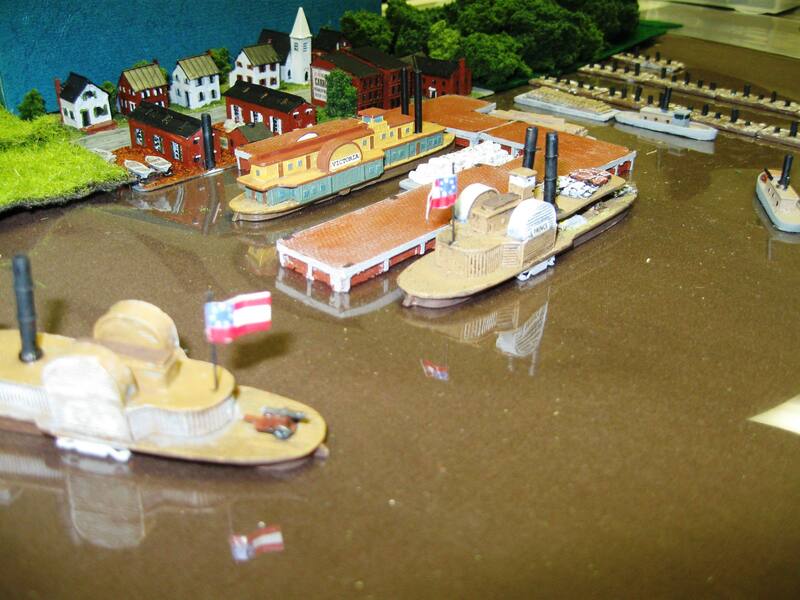 Some of my fleet of 1:600 Thoroughbred and Peter Pig American Civil War riverine / naval ironclads and ships. 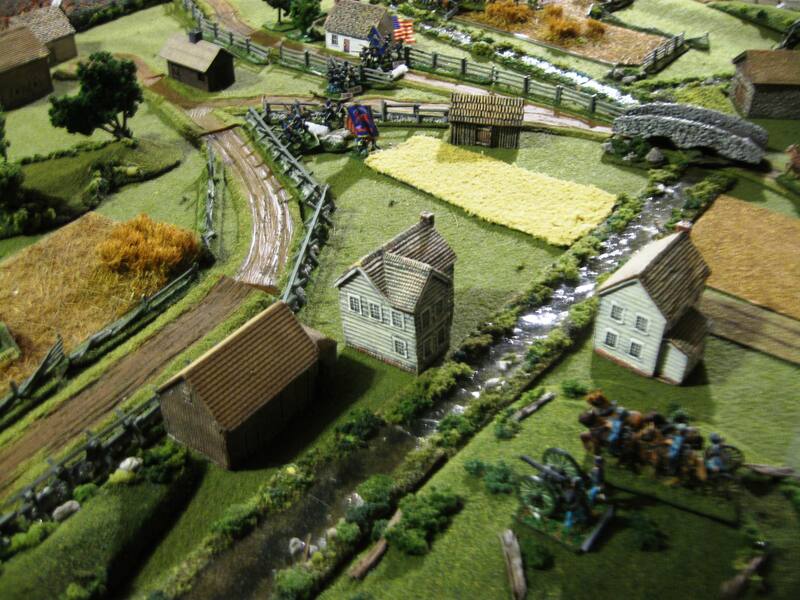 Scott Downing, a veteran gamemaster from the Carlisle region of central Pennsylvania, recently came across my CHARGE! blog and subsequently contacted me. As I am a neophyte at ACW naval gaming, I am always interested in soaking up more information on the Civil War navies and fleets, and their battles and tactics. He has his own blog on WordPress as well and we have since recently exchanged link to each others’ wargaming blogs. Scott just recently started an ACW Naval Shop and Boat Registry, which he is hoping to have it to a point where it becomes a one-stop shop for information on a particular vessel. Scott welcomes your input as to your own research and findings on ships of both the Confederate and Union navies, including brownwater and other riverine, deep sea, and coastal. He is looking for people that can provide info that is missing on the current registry. Users can simply leave comments on the ships page with the info and its source, and he will update the page. So, pay a visit to his neat blog and type away! Any and all documented information is appreciated! 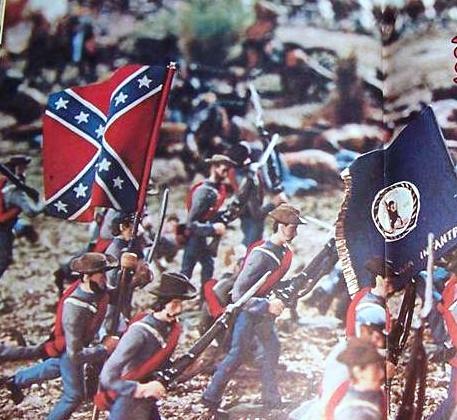 Civil War diorama at the Dobbin House in Gettysburg, PA. Circa 1960s. The 21st annual Civil War Re-enactment will be held on Saturday-Sunday, May 1 – 2, 2010 at Neshaminy State Park, located on 3401 State Road in Bensalem, PA, from 9:00 AM – 4:00 PM, rain or shine. Admission is free! The Appomattox Campaign consisted of a series of battles to the south and west of the capital of the Confederacy, Richmond, Virginia in early April of 1865. These battles ended with the surrender of Confederate forces on April 9, 1865, lead by General Robert E. Lee. 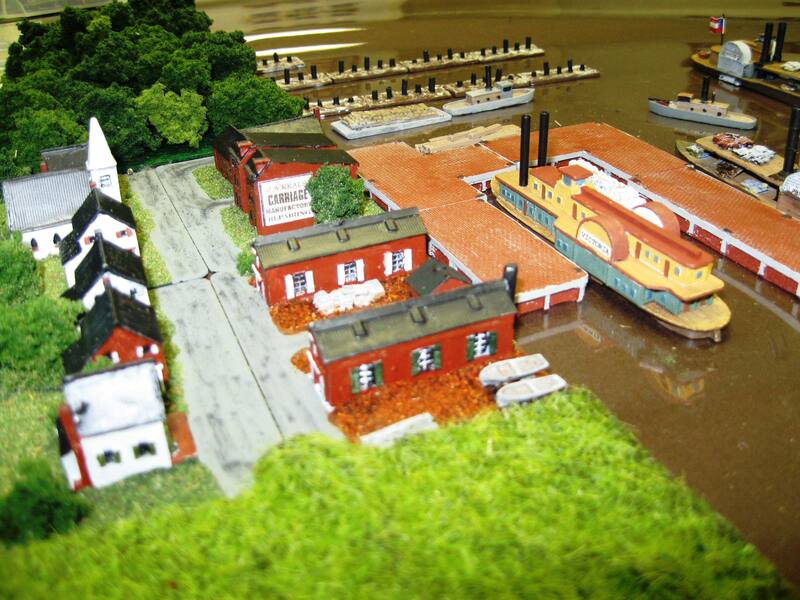 April 6, 1865 is notable for two actions: “The Battle of Sailor’s Creek” and “High Bridge”. “The Battle of Sailor’s Creek” occurred when the Union cavalry exploited a gap in the Confederate line and cut off two Confederate corps, resulting in a Union victory. “High Bridge” saw Confederate cavalry capture Union forces, resulting in a Confederate victory. These two battle actions will be staged during this year’s re-enactment. While admission is free, a voluntary collection will be taken each day of the re-enactment and all proceeds will go toward Civil War preservation efforts. Proceeds from this year’s collection will go to the Civil War Preservation Trust, (www.civilwar.org) a non-profit organization dedicated to the conservation of Civil War battlefields. The Neshaminy Civil War Re-enactment has raised close to $30,000 during its 21 year history, for various Civil War organizations. This event is a joint project sponsored by Neshaminy State Park, the Bensalem Historical Society, the 28th Pennsylvania Historical Association, the Army of Northern Virginia Reenacting Organization, the Delaware Valley Civil War Round Table, The G.A.R. Museum and Library, and Waste Management, Inc.
For more information, please visit http://www.28thpvi.org or contact Ken Gavin, Event Chairman, at 610-809-6540 or kgc28pvi@comcast.net. Third annual Johnny Reb 3 mega-game to be held in Belgium! Second Manassas! 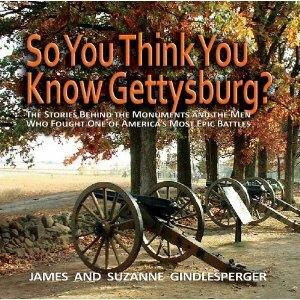 As a native Ohioan and the descendant of numerous Civil War soldiers who served the Union in Ohio and West Virginia regiments, I have always had a strong bias toward books and articles relating to the Buckeye State during the Civil War. Normally I shy away from historical fiction, much preferring historical accounts of people, places, and battles, but in recent years I have become more interested in the genre of Civil War novels. 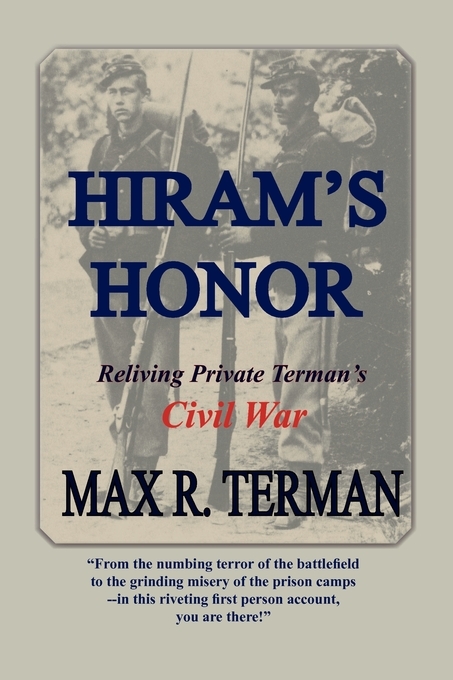 Dr. Max R. Terman’s new book, Hiram’s Honor: Reliving Private Terman’s Civil War, is among the very best of these recent additions to the fictional literature of the Civil War.